Learn the night skies of the Northern Hemisphere with Celestron Sky Maps! This classic collection of seasonal star charts, topped off by a glow-in-the-dark luminous star finder, or planisphere, has been around for years and years! It continues to be so popular because beginning stargazers as well as seasoned amateur astronomers find that this book provides most everything they need to find constellations quickly and delve into seasonal night sky treasures with ease. The front cover of this publication will be used well and often! It is a planisphere—a rotatable star wheel that can be aligned with any date and time (past, present & future), resulting in a display of the night sky for that period of time. When the star finder is pre-exposed to light, all of the major stars will glow in the dark, mimicking the way they actually look in the night sky. Inside you will find a collection of more detailed star charts for each of the four seasons. The charts are clear and concise, allowing you to find objects in the sky with your binoculars or telescope by “star-hopping.” An illustrated reference section provides information on various types of objects. 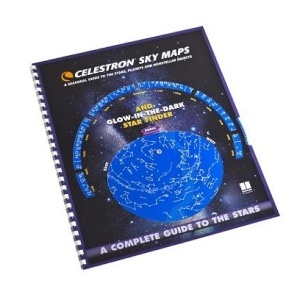 Celestron Sky Maps are made from 13-1/4” x 11-1/4” water-resistant, heavy-duty card stock for years of enjoyment and use. A plastic spiral comb holds the pages together securely, but allows them to lay completely flat for use in the field. Plastic spiral binding lets star charts lay flat. Celestron Planetary Filter Set - 1.25"